News, media, and health and medical related organizations and publications are more than welcomed to contact me, and I'm more than happy to share my perspective. I consider it one of my core missions to not only help support and educate the cancer and medical communities about the young adult cancer experience, but the general public as well. In June of 2016, I published another article with the Cancer Knowledge Network, this time about testosterone challenges after testicular cancer. This can be a major struggle for testicular cancer survivors, especially because it's widely believed by both medical professionals, and by extension patients, that the other testicle will simply "pick up the slack" with regards to testosterone production after cancer. This isn't necessarily true, and it's not nearly that simple, and thus the awareness about this issue tends to be rather poor in North America (I have seen better and more visible and extensive awareness campaigns for post testicular cancer hypogonadism in the U.K., for example, than I have elsewhere). "Testosterone Challenges After Testicular Cancer" went online on June 13th, and I've been very grateful for another opportunity to publish an article with CKN, whose readership is an ideal audience for this sort of article. In November of 2015, I was invited by the Cancer Knowledge Network to write a guest post. CKN is part of Current Oncology, Canada's leading oncology journal, which is read by thousands of oncology professionals and patients. It was a great honor to be invited to write for such a publication and to reach a new audience. This was also a huge opportunity to help spread the knowledge of my experiences, especially to oncology professionals, responsible for the care of many thousands of patients. What better thing could I share with such an audience than an updated list of my list of top lessons learned in five years of cancer survivorship? 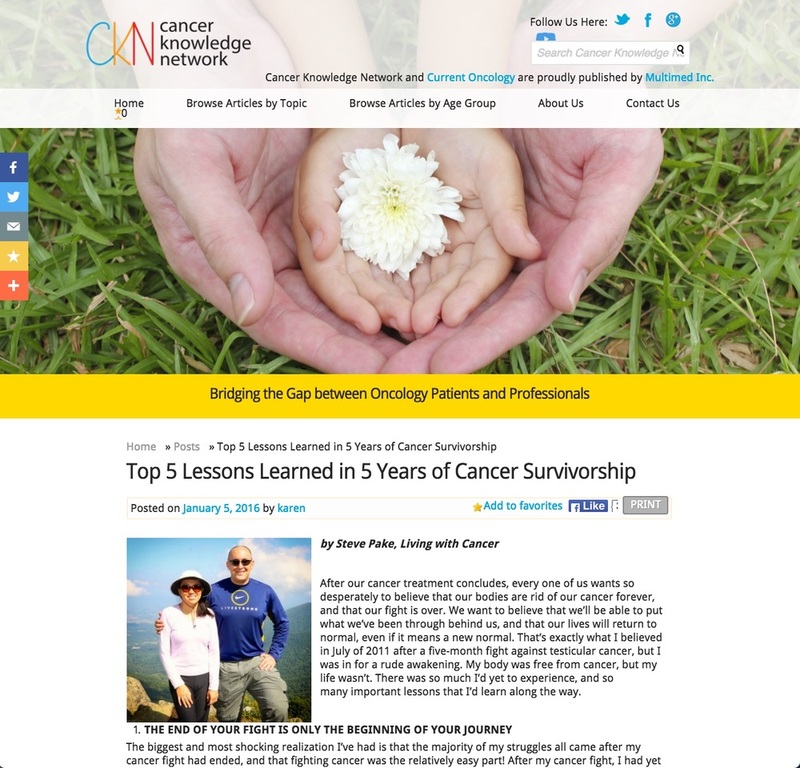 Top 5 Lessons Learned in 5 Years of Cancer Survivorship. This post is now live at the link above, and a great way to start out 2016! Special thanks to Karen Irwin for reaching out to me for the opportunity to publish with CKN, and I hope this makes a positive impact. 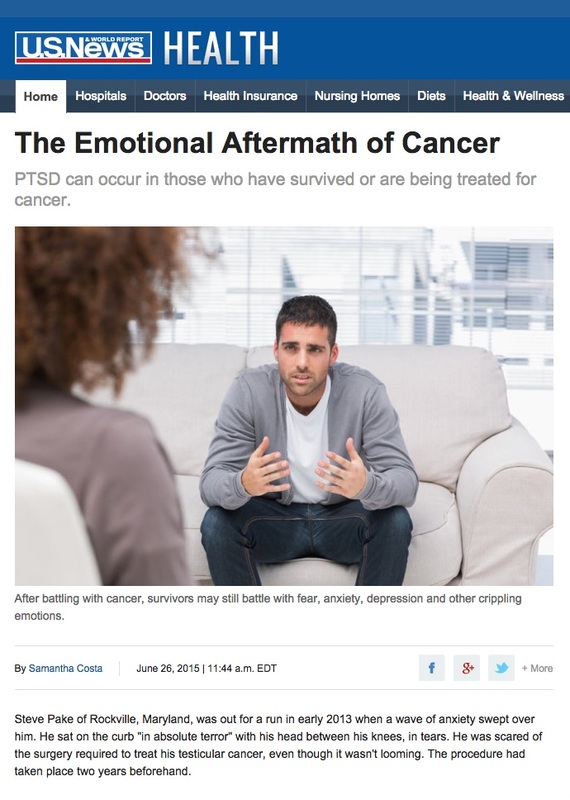 In June of 2015, I was interviewed by Samantha Costa of US News & World Report Health about my struggles with post-traumatic stress after cancer. Sam had seen my blog at the Testicular Cancer Awareness Foundation, "A Snapshot of Post-Traumatic Stress," and reached out via Twitter to interview me. Her piece appears in the link at the right, and is a very well written article on the struggles that we can face after cancer. Sam led the article off with what was, and still is, one of the most bizarre experiences of my life. I was out for a run over lunch in early 2013 when a paralyzing wave of fear swept over me as I ran, which brought me to a dead stop. I was terrified at the prospect of having to get the retroperitoneal lymph node dissection (RPLND) surgery done, despite the fact that I had already had the surgery 18-months ago. The episode was the re-experiencing of a traumatic event, and a classic symptom of post-traumatic stress. For more on post-traumatic stress after cancer, please see my series of essays on the topic starting with Part I, linked below.